The Connections Trail at Seward County Community College will continue to expand, thanks to a $60,890 grant awarded by the Kansas Department of Wildlife, Parks and Tourism. The announcement in late March came at the perfect time, said SCCC President, Dr. Ken Trzaska. 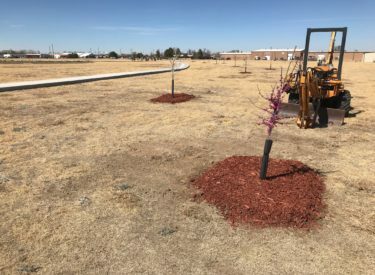 One tangible marker of that aspiration is the ongoing planting of new trees along Phases 1 and 2 of the Connections Trail project. With shade trees and benches installed along Phases 1 and 2 of the Connections Pathway, Trzaska said the Connections Trail system has become more than a sidewalk. Originally designed to link SCCC’s central campus and the Industrial Tech campus, the pedestrian route is now a multi-purpose project. SCCC Grant Writer Charity Horinek said the Parks and Wildlife Grant will build on the idea of providing outdoor recreational opportunities. Kansas Department of Wildlife grant coordinator Kathy Pritchett noted that the college should not start work on the project yet, as paperwork and processing must be completed by the state. “We look forward to working with you toward improving access to trails for all Kansans,” she stated in the award letter. In the meantime, Scheib and his team will continue planting trees and working on other related projects. These include expanded sidewalk on the west side of campus, and tree plantings around the recently-named French Family Field for women’s softball to the east.